For the maturing cities of the Canadian prairies infill has emerged as a critical planning issue related to community resiliency and the ability to manage sustainable growth. It is an issue that connects directly with local communities as mature neighbourhoods transition both in terms of demographics and built form. Here in Edmonton, with the recent publication of a city infill strategy and recent council debates related to infill zoning and lot subdivision, infill politics have come to the fore of municipal politics and public dialogue. It is no wonder that when we talk about infill there is so much to talk about. At the City-Region Studies Centre, we too have been engaged in this conversation, recently co-hosting a round of infill tours and public deliberation. The purpose of these tours was to both explore the types of infill emerging in the city, but also to create the space and opportunity for considering some of the challenges facing the city (see below) and thinking about what types of infill could offer in response. You can find more about the tours, and see some of the streetscapes our participants designed in a report found on our website. Building on the experience of the tours, I would like to use this blog post to think about the need to create a more robust debate and policy conversation about infill in the city. And, in response to recent debates in the press, I would also like to briefly reflect upon the role of planners and publics in ensuring that infill meets both current and future needs of our communities. The most straight-forward definition of infill is simply that it involves building new housing within mature neighbourhoods. However, anyone familiar with infill politics knows that within this process there lurks a much more complex and – let’s call it vibrant – political landscape. Here the debates can be local and personal. It may be that a looming neighbour contributes to lot-shading or privacy concerns. Poor infill can create a wide variety concerns raised along a spectrum including damage to pre-existing houses down to a wide range of nuisance issues. And of course infill necessarily alters our streetscapes challenging local conceptions of character and feelings of community. These are all important considerations and city officials and elected councillors need to be ready to listen. Communities should not be asked to accept infill at any cost. However, looking at the city from a vantage point beyond our individual streetscapes, it is also important to consider infill within a wider conversation about the resilient and sustainable future of the city, including its communities, neighbourhoods and streetscapes. Beyond simple definitions, the idea of infill carries with it a wide variety of aspirations. Often at the fore of these discussions is density, a growing priority for cities across Canada, seen as a means of supporting local economies, fostering community vibrancy or populating sustainable transit options. In many instances, infill is seen as a means of re-creating density in neighbourhoods where the change in family composition and demography has shrunk populations. Infill could be a solution to maintaining an active community league, keeping a local grocery store or strip mall economically viable or making sure local schools are full. These are all things that many of us would see as supporting successful communities. Other rationales voiced for infill include providing housing choices for a diversifying population. Cities dominated by single-family bungalows are now trying to create the conditions for providing market choices that address the needs, lifestyles and investment opportunities of a diversity of populations. This could include housing which caters to smaller families, single tenants or the elderly. Increasing house prices, affordability, and the opportunity to allow a wider population entry onto the property ladder are also considerations, although as new development moves prices up this is far from easy, or certain. Other items on the list of proposed benefits for infill include the revitalization of aging (and often poorly constructed) housing stock, space to promote more environmentally sustainable construction (enter photo of Triplex on tour) or opportunities to diversify design and create new streetscapes. Any single infill project is unlikely to achieve all of these aims, indeed many of them would contradict with one another. The infill challenge is thus about understanding how new builds can support some of these objectives, and determining in what contexts these values can be realized (or not). This is the more nuanced conversation we need to have about infill. Getting infill right means addressing choices and negotiating between values. It means making decisions about whether growth happens on the edge of the city, or within its current footprint. We are challenged to determine whether the “character” of one street is maintained while another is identified to support change. Decisions need to be made about how and where affordable housing can be supported in order to be accessible to young families and first time buyers. As planning scholar Bob Summers has noted, family housing needs to adapt to the needs of families today. It means thinking about how our neighbourhood designs contribute or hinder our responsibilities to grow sustainably as a city. And it should be clear by now that doing nothing is also a choice with potentially negative consequences for how our communities will evolve into the future. How can we engage these challenging questions? And, who can be involved? 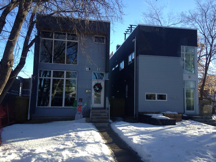 To date, the City of Edmonton has been considering a relatively narrow range of tools that open up opportunities for infill. This includes adapting aging zoning laws in mature neighbourhoods to permit the subdivision of lots to encourage the building of skinny homes, as well as rules making it easier to build basement and garage suites. These changes may well open up opportunities for infill and a diversity of housing opportunities in an urban landscape (across the city) which is dominated by single family units of similar style and scale. However, these policies do not themselves support the more nuanced types of conversations required, nor will they necessarily deliver all the benefits hoped for. They are typical of the types of tools municipalities employ to structure growth and development. However, is it also possible to imagine processes that more directly and deeply account for community and the depth of issues at stake? City planners have an essential role in this respect, and have rightly found themselves at the centre of infill politics in Edmonton. Questions are being raised not only for or against infill but also about what the role of planning ought to be in regards to development. It is common for developers to make the argument that planners simply act as facilitators; this is code to suggest that the City should minimally promote positive conditions for the development industry and permit the market to determine what infill looks like in Edmonton. From a different perspective, a recent opinion article in the Edmonton Journal suggests that good planning involves maintaining current communities by refocusing energies on effective maintenance. Likewise, an energetic population of new urbanists, designers and architects are successfully lobbying planning to open up opportunities to create the streetscapes they dream of. Cynically, each argument might be dismissed on the basis of self-interest. I prefer to find value in the bringing together of all three positions. Successful city building requires positive development, engaged communities and creative experts. In this regard, the City has made some positive steps forward. Most notably the Evolving Infill strategy was informed, in part, by an engagement with members of the public. The recent launch of a toolkit for encouraging community dialogue is also a positive means of creating opportunities for ongoing dialogue. These are useful initiatives, but as infill continues to reshape our city we must find the means for maintaining robust relationships between planning, development and community. Planners, far from standing in the way of the future of the city, are situated at the intersection of these various stakeholders. As Paul Bedford (former Chief Planner, City of Toronto), reminded us at a recent talk, planners are privileged in their ability to support futures and do so through their expertise and vision, but also through their engagement with communities and city builders. Far from getting out of the way of infill debates, we need planners to lead and broker relations in creating infill that responds to the unique values and aspirations of specific communities. This is different from simply tinkering with zoning and bylaws, but implies engaging communities in planning for the future and supporting positive economic relationships in bringing the communities’ values for development forward. The questions requiring our attention are not simply whether we infill or not, but rather are about the ways in which housing contributes to the types of neighbourhoods and cities we want for the future.